My Golden Gloves champion father, Allie Santora, taught me how to throw a left hook. After reading Pope Francis' latest apostolic exhortation -- "Gaudete and Exsultate," Latin for "Joy and Exultation," subtitled "On the Joy of Holiness in Today's World" -- it's clear that for Pope Francis, the left hook comes naturally. Much of the document speaks about the spiritual quest for holiness as a vocation for each person. But Francis dispenses with the niceties early on when he turns "church militant," a classic concept, on its head to deflate a website with the same name. Church Militant, notorious of late for calling out any deviation from their self-described orthodoxy, has been getting Jesuit James Martin disinvited from Catholic speaking engagements. Martin wrote a mild book, "Building a Bridge: How the Catholic Church and the LGBT Community Can Enter Into a Relationship of Respect, Compassion and Sensitivity,'' that's more provocative in tone than doctrine, which it adheres to faithfully. Church Militant's social media presence is larger than its membership, which is insignificant. Francis has been opposed from cardinals down to priest organizations for creating a slippery slope in morality by diluting what some would call immutable church dogma. So Francis takes them on by calling out "two false forms of holiness that can lead us astray: gnosticism and pelagianism" – two heresies from early Christianity. 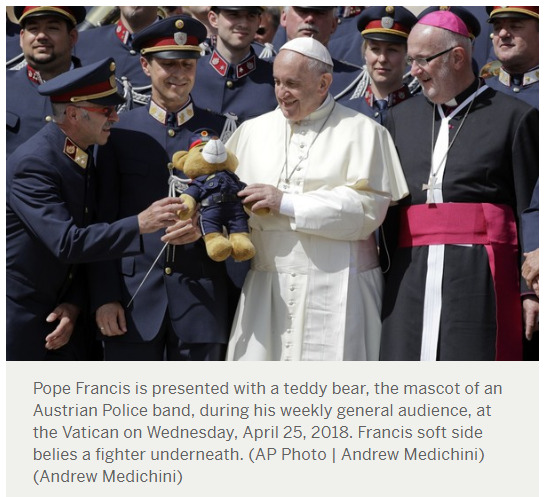 The first, Francis writes, "gives rise to a narcissistic and authoritarian elitism." Contemporary gnostics believe that they possess special knowledge that is not available to all. This makes them superior and, Francis wrote, "they judge others based on their ability to understand the complexity of certain doctrines." They possess "an encyclopaedia of abstractions," Francis says. Pope Benedict XVI gave some credibility to this concept when he talked about a smaller, more pure Catholic church. This pope is much more expansive. "Very often it is a holiness found in our next-door neighbours, those who, living in our midst, reflect God's presence,'' he writes. "We might call them the middle class of holiness." He also extols what he calls the "genius of woman" and the feminine style of holiness, which he calls an essential example of God's holiness in the world. He also cautions about pelagianiam, which gives humans an oversized role. Francis calls out their hypocrisy by trusting in their own powers "because they observe certain rules or remain intransigently faithful to a particular Catholic style." Could Francis be describing the so-called dubia cardinals, who questioned the pope's catholicity in his previous exhortartion, "Amoris Laetitia," ("The Joy of Love")? This document set the stage for applying the internal forum or conscience to divorced and remarried Catholics. Francis ignored his critics. It is said that we get the pope that the Church needs and not necessarily what it wants. Francis would refer to this as a God of surprises. "When somebody has an answer for every question, it is a sign that they are not on the right road,'' he writes. "God infinitely transcends us; he is full of surprises." In the 2013 conclave that ended with him being named the next pope, Archbishop Jorge Mario Bergoglio was ready to return to Buenos Aires to retire. God does surprise. Today, Francis fascinates and frustrates because he leads perhaps the largest monarchy in the world yet encourages revolution from below. He welcomes critics but seems undeterred. He sees this as the true successor to earliest Christianity, which fostered individual expressions of faith because those who followed "The Way" lived lives of holiness and that inspired them to change the world. Rather than back down, he is moving forward at 81 and perhaps in the best spiritual health of his life. Francis is not holding on to the ropes of the ring, avoiding the fight. He is right in the center, truly engaged and throwing those judicious, left hooks.